Honoring the 7th President of the U.S.
With the introduction of the newly redesigned $20 bill on October 9, 2003, American currency became much more colorful. The new bill features the portrait of Andrew Jackson, who rose from humble beginnings, becoming a war hero, wealthy farmer, politician, lawyer, and eventually, seventh U.S. President. With background colors of peach and blue, this $20 bill is the first U.S. banknote since thebeginning of the 20th century to prominently feature a color other than green. 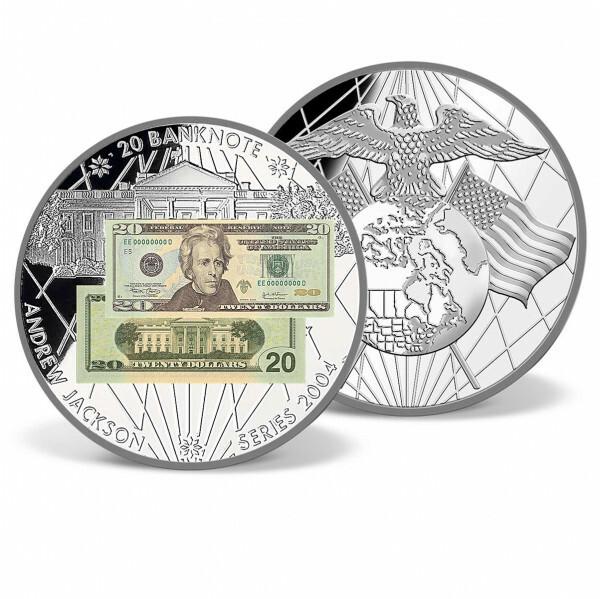 American Mint is pleased to offer our beautiful $20 Andrew Jackson Banknote Commemorative Coin, which pays a fitting tribute to the legacy of the man affectionately known as "Old Hickory." Exquisitely minted and layered in fine silver, our coin features a remarkably detailed inlay of the Andrew Jackson banknote on the obverse. The reverse includes a portrayal of an eagle soaring majestically above the earth and an American flag in the background. American Mint has a long, proud tradition of offering high-quality products at reasonable prices, which is why so many collectors buy most of their collectibles from us.Purchase your Andrew Jackson banknote online today at an incredibly low price. To order, add the item to your shopping cart and complete the quick, secure checkout process.